Polyamines have been demonstrated to play an important role in adventitious root formation and development in plants. Here, we present a detailed analysis of influence of exogenously added polyamines on adventitious root development and its relationship to cold tolerance in Virginia pine (Pinus virginia Mill.). Our results demonstrated that polyamines putrescine (Put), spermidine (Spd), and spermine (Spm) at 0.001 mM improve rooting frequency and promote root elongation. Put, Spd, and Spm at 0.01–1 mM decrease rooting frequency and reduce root elongation root elongation. Measurements of diamine oxidase (DAO, EC 1.4.3.6) and polyamine oxidase (PAO, EC 1.4.3.4) activities showed that higher DAO and PAO enzyme activities were obtained when high concentrations of polyamines were applied and when plantlets were treated for 5–7 week at 4°C and 16°C. Survival rate of plantlets increased with the treatment of polyamines at low temperature. 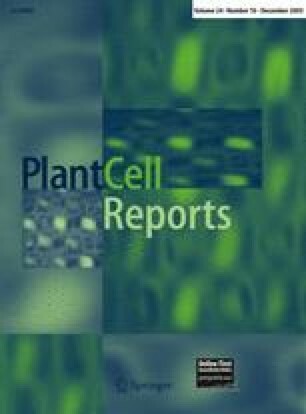 Polyamines increased mitotic index of cells in root tips of regenerated plantlet cultured on medium containing 0.001 μM Put, Spd, or Spm, but did not increase mitotic index in tissues of needle tips of the same plantlets. These results demonstrated that polyamines promote root elongation and growth by increasing root cell division in regenerated Virginia pine plantlets. The authors are grateful to Nicki Whitley, Nicole Bloom, Tinya DelaGarza, and Ambrosia Yarn for their support in isolating mature embryos from seeds for production of regenerated shoots used in this study.